Batad is the central mountains of Ifugao in the area that holds three world cultural heritage of thousands of years ago which was inaugurated by UNESCO, the Rice Terraces which created by ancestors Batad indigenous people. 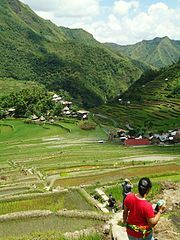 The rice terraces of Ifugao Mountains spread that covers more than 10000 square km. Batad rice terraces in the most fascinating among others. In Batad, rice terraces bounded by rocks of the human head are arranged neatly, like a fortress. From the terrace down to the roof terrace is about 3 meters, and all of these are composed of stones without cement adhesive. To move from the lower terrace to the upper terrace, there is a sort of staircase composed of stone slabs of rock that lies between the main constituent, looks like a ladder. Why is this Batad be the most riveting? Because terracing here is very high, ranging from valley to near the summit of the hill. This is what makes Batad as a favorite destination of foreign tourists when visiting Banaue. After a short pitch breaks and lunch, you can immediately continue trekking along the Rice Terraces event and to the waterfall. The weather is usually not so supportive, overcast and sometimes drizzly hit. There was a bit of an unwritten rule aimed at tourists visiting the village of Batad, travelers are not allowed photographing Batad residents without obtaining prior consent of the population who want to be photographed. According locals belief, if tourists take photos without permission is tantamount to taking the soul of the person portrayed. Indeed, residents rarely willing Batad taken photos. On the way down the rice, usually with heavy rain, travelers are advised to bring a raincoat and umbrella. In the middle there is a small shack rice that serves as a resting place while working on the paddy farmers. After passing through rice terraces, you can continue the journey to the waterfall. High waterfall is about 30 feet, but the water is very swift rate of above. Once satisfied playing in the waterfalls, you can go back to the guesthouse. Trekking for four hours is usually quite tiring and exhausting. You can relax yourself and enjoy a cold afternoon at the guesthouse.